The Thorn Mercury frame is a 700c frame, with fairly tight geometry, similar to a modern Audax bike. It has been designed specifically for use with the Rohloff EX box hub, it won’t take derailleur gears. The frame will accommodate 40c tyres (35c with mudguards), when using a rear disc brake. When used with a deep drop (47-57) twin pivot calliper rear brake will take tyres which measure 30mm. 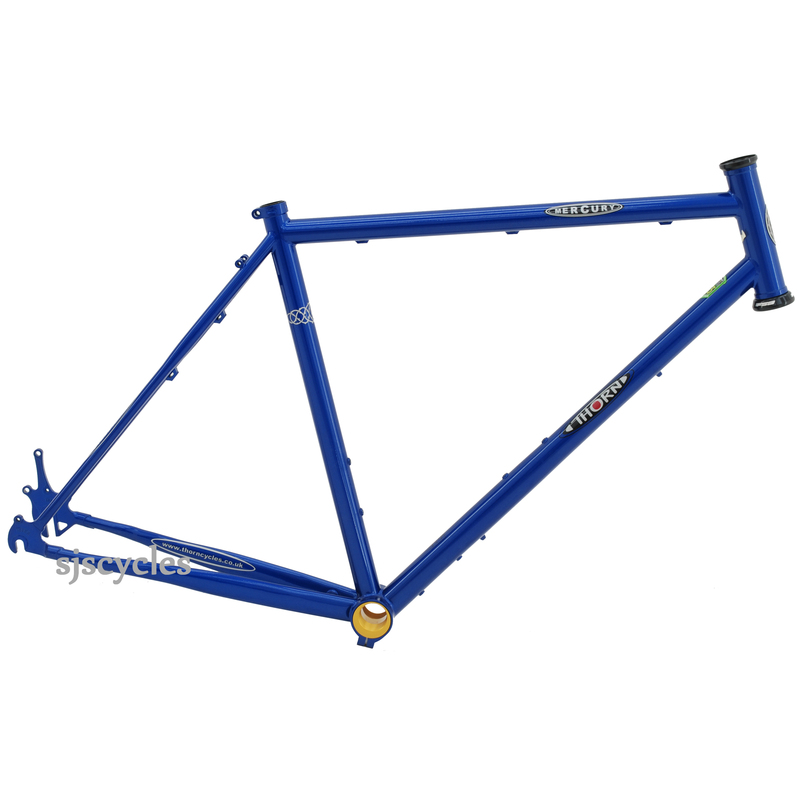 Mercury frames are available in 8 different sizes to suit the majority of riders. There are 4 sizes with long top tubes, these would normally be chosen for use with straight bars. 4 sizes have short top tubes and should be chosen for use with drop bars, or by cyclists who need a very relaxed position with straight bars. The Reynolds 853 steel frame tubes and Reynolds 725 stays are of the highest possible quality...every tube has been specifically designed for its intended purpose we haven’t just put up with the stock sizes and dimensions Reynolds offer to anyone. The Mercury is responsive, comfortable and handles perfectly. Several customers have told us it is not just the best steel frame - it’s THE best frame that they have ever ridden! It’s very versatile - at one extreme it can be built into a Rohloff equipped, Drop bar "Sportive" bike - at the other extreme, using our 700c Super Tourist forks and F&R carriers, in trekking guise, it will whisk over 30Kg of luggage along reasonably on good surfaces. All the frame’s fittings and the vertical, Rohloff EX Box specific ISO disc dropouts, are stainless steel to prevent corrosion. Drive chain tension adjustment is taken care of via our new lightweight, stainless, mini eccentric BB shell - and its anodised alloy eccentric. The frame is supplied with a 1 1/8" FSA Orbit XLII headset, 27.2 350mm alloy Thorn seatpost, calliper rear brake adaptor Eccentric insert and tool. Does not include: fixing screws, down tube cable stops or bottom bracket.